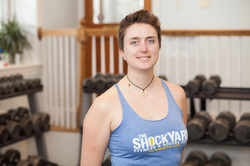 Laura is an ACSM-certified Personal Trainer with a B.A. from Oberlin College (2005) and a Ph.D. from Indiana University (2013) in the Biological Sciences. She has over seven years of experience coaching and training both new exercisers and seasoned athletes. Teaching clients new skills is her greatest passion. Laura's favorite athletic accomplishment is skating with the Bleeding Heartland Rollergirls at the Women's Flat Track Derby Association's Division 1 Playoffs in 2013 (http://indianapublicmedia.org/arts/flatliners-heart/ ). Casey is an ACSM-certified Personal Trainer with a B.A. from Smith College (2005) and a Ph.D. from Indiana University (2013) in the Biological Sciences. She has completed over 200 hours of classroom and hands-on, practical training. Casey loves helping clients learn to believe in themselves and reach their goals. Her favorite athletic accomplishment is completing a trail mini-marathon. The name "ShockYard" comes from our time playing roller derby. In derby, it is customary to dub yourself with a punny moniker that becomes your persona. Laura's derby name is Shock 'n Roll and Casey's is Bombshell Shock. Our teammates started referring to us as "The House of Shock" or just "The Shocks" and it has become our family name. We thought it fitting to incorporate the word "shock" into our business name, as participating in roller derby is what really inspired us to become fitness professionals in the first place.